American actress and model Maggie Q has starred in many notable productions including Mission Impossible III, Nikita, Divergent and many others. Although she started with modeling, Q is a natural in the business and caught the attention of major movie stakeholders in the late 90s. It will be interesting to dwell on Q’s journey to success which should be a must-read for any aspiring Hollywood star. On this note, you will find lesser known facts about the talented actress here. She was born Margaret Denise Quigley on May 22, 1979, in Honolulu Hawaii. She had her primary education at Waena Elementary School and also attended Wheeler Intermediate School. Q was very sporty in school and had the body that went with it. She wasn’t just athletic but had a beautiful body build that won her ‘Best Body’ award in school. Her athletic inclination led her to many stints while at Mililani High school. Q ended up getting an athletic scholarship to a private university but left Hawaii in search of greener pastures as her parents could not cater to her financial needs. Leaving Hawaii for Tokyo with the hope of continuing her education sooner than later, Q and her ‘best body’ went into modeling. Maggie was 17 at the time and moved from Tokyo to Taipei to Hong Kong in search of opportunities. During this time she made a decision to change her name to Maggie Q after she saw that the Chinese folks had a hard time pronouncing Quigley. Q soon came in contact with legendary actor Jackie Chan and the rest was history. The legendary actor who saw a potential in Q started teaching her martial arts stunts and how to professionally apply them in movies. Q’s acting career kicked off in 1998 in the TV Drama House of the Dragon. Two years later, She starred in her first film Model from Hell. After an impressive performance in her next movie titled Gen-Y Cops, Q with the influence from Jackie Chan was featured in Rush Hour 2. She starred in the action movie Naked Weapon as Charlene Ching a martial artist assassin in 2002. Maggie Q got her major breakthrough in 2006 with the movie Mission: Impossible III where she starred alongside Tom Cruise. She then appeared in Live Free or Die Hard directed by Len Wiseman. In 2010 Q became a cast and lead character of the CW action series, Nikita. Her role in the series earned her lots of recognition and positive reviews from critics. Maggie Q’s next big project was her role as Tori Wu in the film Divergent, an adaptation of the 2011 novel of the same name. She reprised her role as ‘Dauntless’ faction member in the sequel The Divergent Series: Insurgent. She also reprised this role in the third sequels of the movie The Divergent Series: Allegiant in 2016. Q has continued to wow her fans and her counterparts with her remarkable roles. Maggie Q has a lot to show for her on-screen and professional stunts as well as her remarkable movie roles. The talented actress sits on an estimated net worth of $8 million. Asides from her movie stints, Q has her modeling stints with some agencies to also thank for her financial status. The actress and model is said to earn an estimate of $76,000 as her annual modeling salary. Though of American nationality, Maggie Q is of mixed ethnicity. Her father who is of Irish and Polish descent met her Vietnamese mother during the Vietnam war. She is from a Catholic family and was raised with the doctrine and tenets of the Catholic church. She has three sisters Andrea, Maria, and Nicole Quigley. Maggie Q like her counterparts has some stories written down in her love diary. 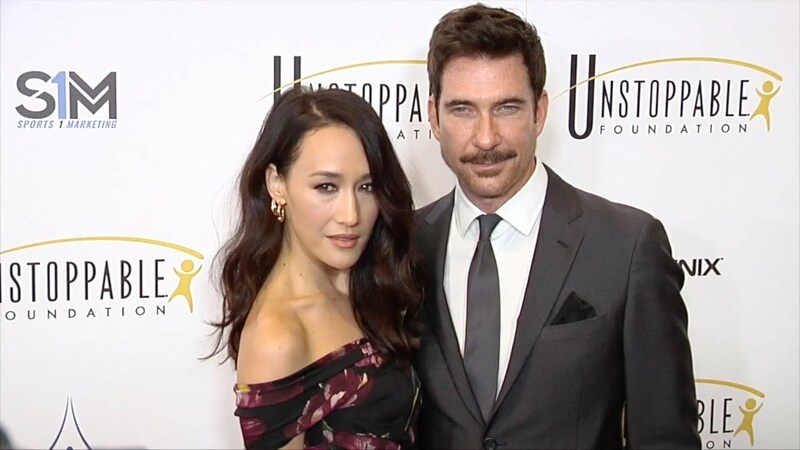 Although not much is known about her past relationships, Q is in a relationship with Dylan McDermott whom she starred with in Stalker. The two became engaged in 2015 after McDermott popped the question. Due to their long-term engagement, fans mistakenly refer to them as a married couple. But the couple seems to be taking their time before opting for the nuptials. Dylan McDermott was married before to Shiva Rose. With his ex-wife, he has two daughters. Asides acting and modeling, Q is also an animal rights activist. She is actively involved in animal rights campaigns including PETA Asia’s campaigns on vegetarianism. In solidarity with the animal rights movement, she went vegan and is still a vegetarian till date. In 2005 she co-produced Earthlings, a documentary centered on animal treatment. Maggie Q is known for her well built and awesomely fit body which makes her to effortlessly fit into any stunt movie role. She stands at a height of 1.68m (5ft 7in). Q and her well carved 33-23-24 body (bust, waist, and hips), weigh 51 kg which is quite proportional to her height. For her shoes, she wears size 9 (US).